Now days the need of note taking seems to be fulfilled by cell phones. We carry this device in our pocket wherever we go and when we have to jot down something to remember it for later, we use them. Whether it is writing down someone's name or whether it is to remember your shopping list when you go to the supermarket, it is quite convenient to use phones. Keeping that in mind, phones have their own note taking features. Some have those inbuilt while some phones need additional apps to be able to take down notes. I have seen people jot down stuffs even in their contact list because it is quicker. But I recommend people to have note taking apps on their phone because they are mostly lightweight and their features like being able to make lists, check off lists and synchronization come in handy. This is a very popular note taking software. You can easily create short notes or things to do in this app. You can also attach pictures, audio or even take picture and attach them to notes. There are tons of other useful feature like being able to dictate notes. 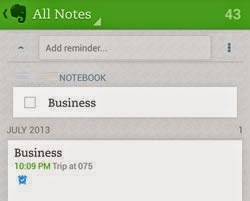 The notes that you create also sync with the Evernote server. That means you can get the notes anywhere you like from your cell phones to your personal computers. A very attractive note taking application for android. You can easily jot down texts to remind yourself of important things for the future. You can create lists and check items off the list. This app is quite handy to use and the user layout is nice. You will easily be able to take down important notes with this app. Keep is a simple note taking app. You can take down notes and they will be saved right there. You can also create lists of things to do and check off the things as you complete them. 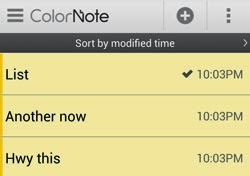 You can also assign a color to your notes so that it is easy to separate them. Keep syncs with your Google Drive account and saves your note there. You can access your notes directly from Google Drive when you do not have access to this app. FreeNote is a great app for taking down notes. You do not always need the keyboard to take notes with this one. You can easily drag your finger across the screen to make out written scripts that will be saved as notes. This does not convert your scribbled scripts to alphabets. But the note taking feature is quite nice. 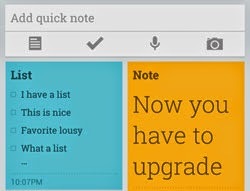 This note softrware also has many features such as adding pictures to notes. 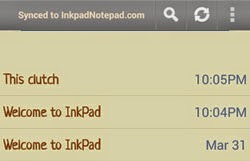 The free version of Inkpad is enough to take down simple notes. Lists are supported as well. This app requires you to connect a google account so that you do not lose your notes forever and you have the ability to take them everywhere you go. This free version does have ads but this is a good note taking app.